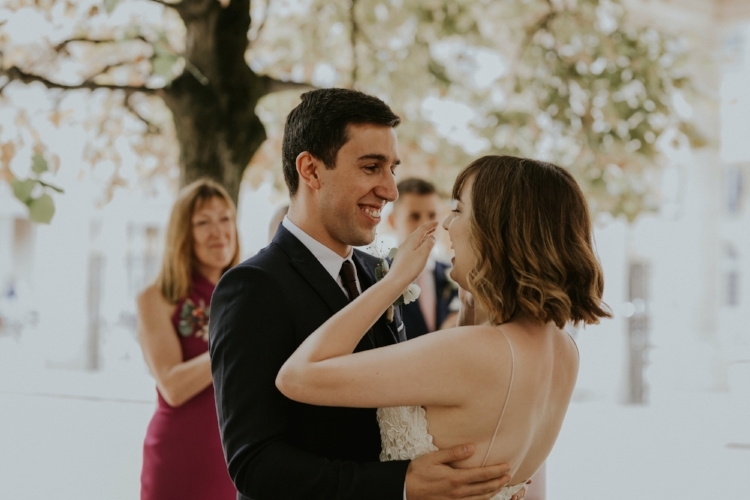 I was looking through our wedding photos the other day, deciding on which ones to print and frame on my new desk, when I realised that I haven't shared the day over here with you yet. It's been over six months now since that summer day in Paris and I can't wipe the smile of my face whenever I look back through these photos and remember all of our favourite moments from the day. Having our wedding day in Paris was awesome. We had our legal ceremony a few days beforehand back here in Manchester at the town hall with just our parents there as our witnesses. We got ready together in the morning, made our way to the town hall and met our parents there, said "I do" and signed the register, then left the room to "Everywhere" by Fleetwood Mac. We went for a meal the six of us, then Alex and I checked into a hotel (which may sound a little crazy when your own apartment is a 15 minute walk away, but you only get married once right? And if you're ever in Manchester and looking for something extra special, the suites at the King Street Townhouse are pretty awesome), before meeting up with our friends for a drink to celebrate, and then we ordered pizza to our hotel room and it was the best way to end our first day as a married couple. And if that's all we did to get married it would have been enough, what mattered most to us was that we said "I do" and became husband and wife. 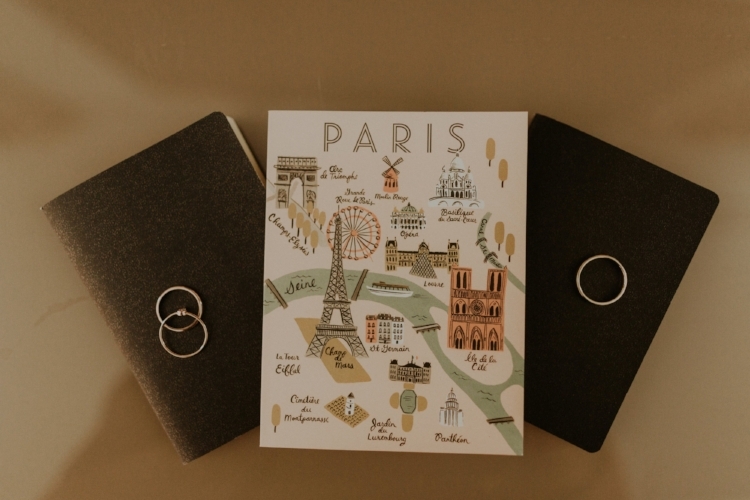 But I'm also so glad we planned something super special in Paris for our wedding day, and to spend four days there with our families is something I will never, ever, forget. And why Paris? Well, it's an awesome, incredible, beautiful city. 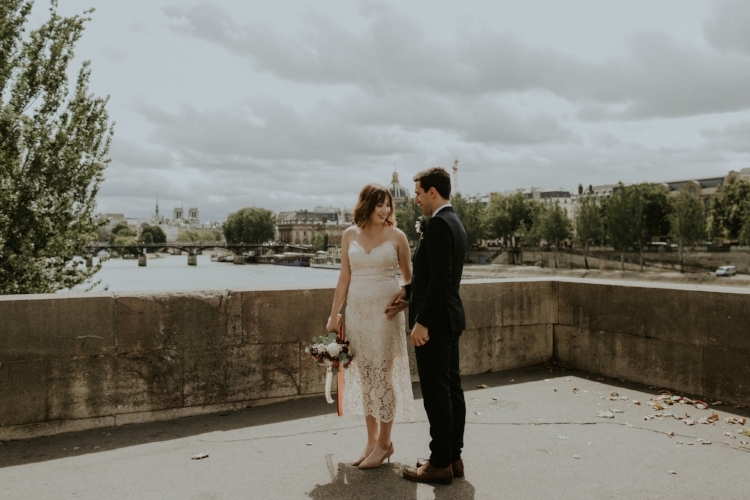 And it's also a special place for us as it was during a trip there in 2016 that we decided together to get married so once we decided that we wanted to have a super simple ceremony abroad, Paris was our first choice. We invited our parents, brothers and their girlfriends to join us as we wanted something very low key and simple for the day. They like to joke that they gatecrashed our elopement, but I'm so glad they were there with us to celebrate the day. The only tough part of making this decision was knowing that our friends wouldn't be there. I've had the same group of friends for over a decade now, we've grown up together, been there for every high and low of our adolescence and 20s, and they've become Alex's best friends now too and after all of these years they feel a whole lot like family. But as we had a mid-week ceremony we knew everyone wouldn't be able to take the time off work (many of our friends are teachers) and we also knew that if lots more people came we wouldn't be able to have the very simple day that we wanted. But instead of being angry at us for this, after we got home from our mini-moon in Venice our friends threw us an awesome wedding party and we felt so loved and it was so incredible to be able to celebrate with them in that way. They had a cake for us to cut, they threw confetti, they gave speeches, we danced, we had a quiz and played newlywed games, and it was a night I will always, always, remember. We arrived in Paris on the Monday afternoon and we all got settled into our hotels (and my parents on their pretty awesome barge that they rented on the Seine). 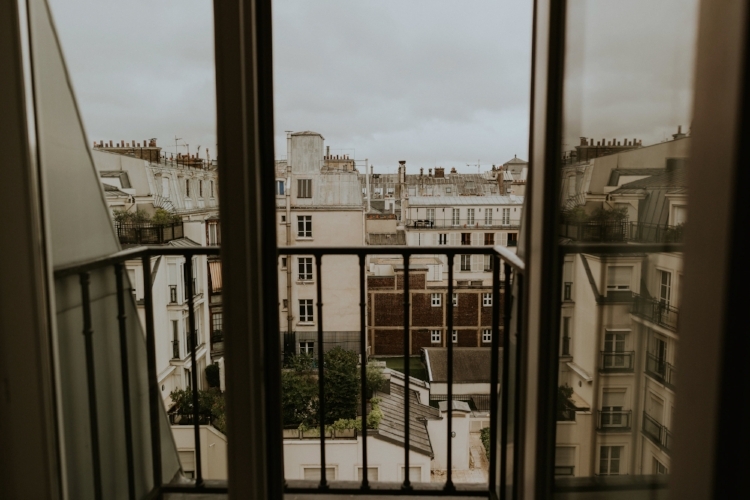 We stayed at Hotel Regina, which is a beautiful hotel located just across from the Jardin des Tuileries and the Lourve, and we spent our first evening in the city taking a stroll along the river and feeling oh so happy to be back in one of our favourite places. On the Tuesday Alex and I went flower shopping before we met up with both of our families on my parents barge where we spent an afternoon hanging out and making my bouquet, buttonholes and corsages for everyone and whenever we look back on the trip to Paris we all say that this was one of our favourite moments. It was so awesome to see our families get on so well together, and so nice to all spend some quality time together too. Wednesday was the big day. Alex and I started our morning by ordering breakfast to our room before getting ready together for the day. Our awesome photographers, The Curries, joined us in the morning and for two awkward introverts we were both very surprised how comfortable we were to have them in the room with us. 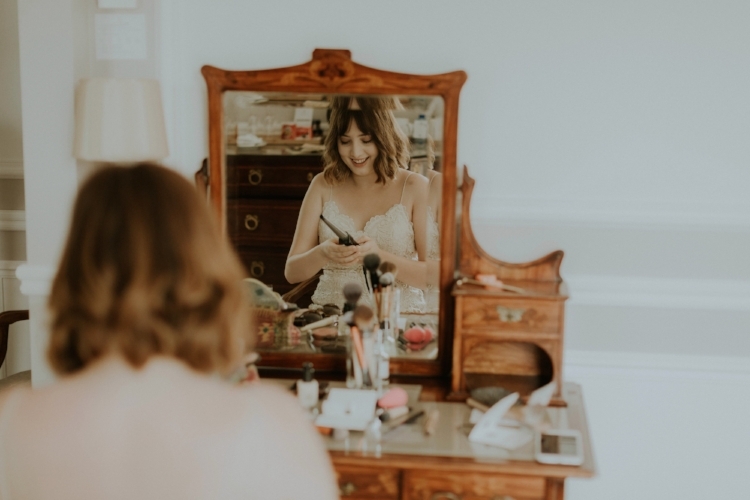 I love looking back on these photos of us getting ready together, it was so nice for it to feel just like any other morning and for Alex to do up my dress and calm me down when I was convinced that my hair was frizzy. We had a tiny freak out in the morning as rain was due, but we were oh so lucky as the skies cleared up during our ceremony and it ended up being a bright and beautiful morning. 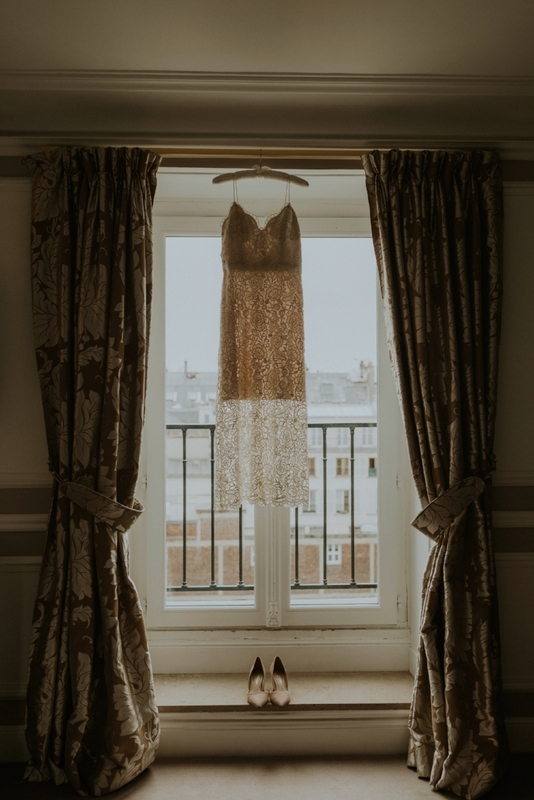 Once we were ready we left our hotel and walked to the Palais-Royal, which is where we were having our ceremony and where our family and celebrant were waiting for us. On route, people kept stopping us to say congratulations and happy wedding day which kept making us smile and laugh, and I was fast reminded how much I hate wearing heels and I crossed my fingers I would make it through the day without crying in pain or falling over. 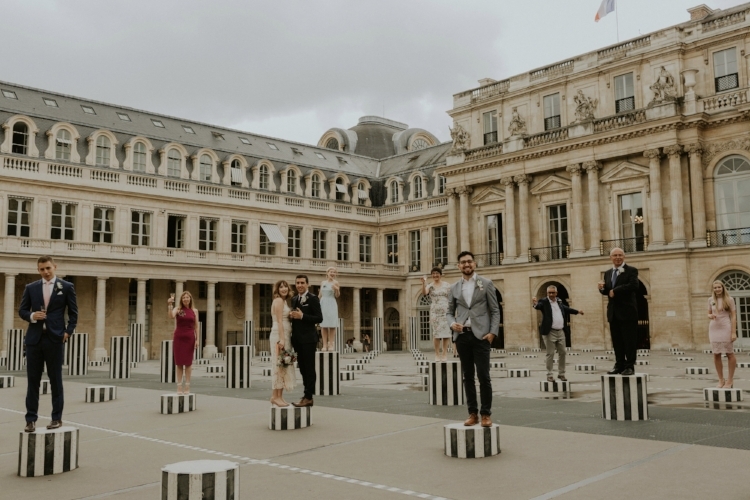 The Palais-Royal was the perfect spot for our ceremony, our families were waiting for us beneath some rows of trees and even though it's a pretty popular spot in the city it still felt secluded and quiet which was nice. Our ceremony was probably my favourite part of the day. 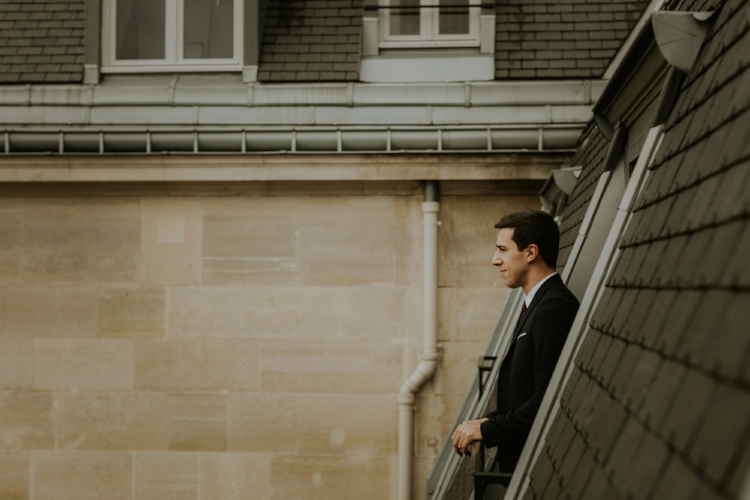 Because we were already legally married and had exchanged the traditional vows at the town hall it felt like the pressure was off - we just had to stand up there and exchange vows that we had written ourselves and I will honestly never ever forget that moment. 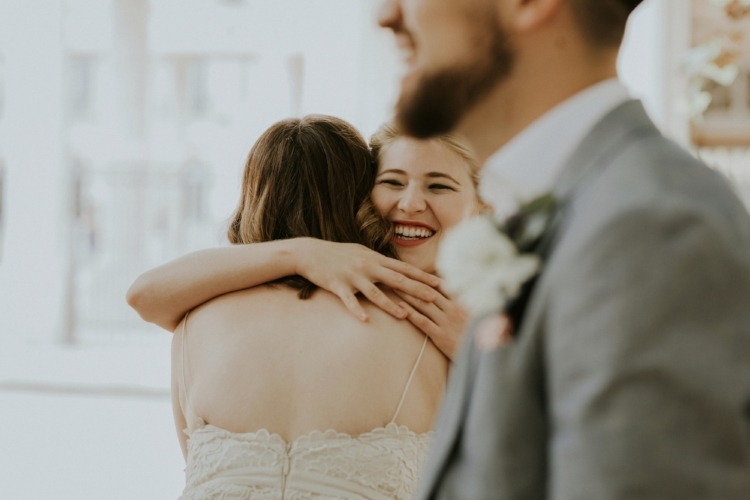 I thought I would find it awkward pouring my heart out in front of our family and the celebrant, but in that moment you just forget that everyone else is there and you tell your favourite human in the world how much you love them and hear them tell you the same back. I went first and I very almost burst into tears but I just about made it through. I remember Alex telling me, in the early stages of wedding planning when I wondered if maybe I just wanted us to elope the two of us and he wanted our families there, that he was proud to be becoming my husband and he wanted them to hear his vows and I didn't truly understand what he meant until we were standing there and holding hands beneath those trees. If we were ever unfortunate enough to have a fire in our home, after saving our animals I think our vow books would be one of the first things I would try and save - if you're ever thinking about writing your own vows, I say go for it 100% as I'm so so glad that we did. After the ceremony and lots of hugging and congratulations we all cheers'd and toasted to the moment before having our family photos taken - that shot of us all on the little podiums always makes me smile. Then our families threw confetti and I think I might have spent the rest of the day with Alex finding random pieces of it in my hair but it was so fun and we have the photo framed in our bedroom and it's one of my favourites. After that we said our goodbyes for the next hour while Alex and I went off with our photographers for some more photos before we all met up again soon for lunch. 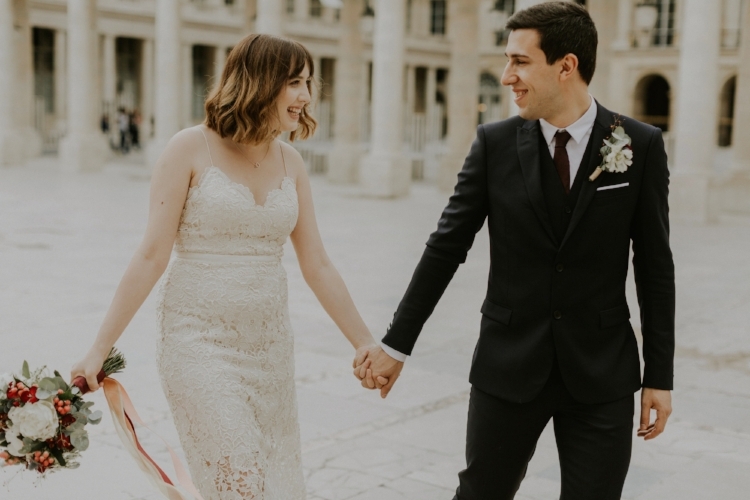 We spent about an hour wandering through the city with our photographers and even though I was starting to feel a little tired and low on spoons (chronic illness doesn't go away just because it's your wedding day) I love looking back on these photos and they always make me want to book a flight back to Paris straight away. Afterwards Alex and I nipped back to our hotel so we could pick up the cards and favours that we had for everyone (and so I could change my shoes) before we went to meet up with everyone at Daroco for lunch - we picked this restaurant on a little bit of a whim when I stumbled across it on Instagram and saw how nice the interiors were. The food was delicious and the staff were awesome, so it definitely ended up being a good choice. Afterwards we were all in need of a little nap so we all retreated to our hotels (and barge) before meeting back up later in the evening at the Notre Dame and we had a sunset walk through the city all of us together and it really felt like the perfect way to end such a special day. I learned so much during the wedding planning process. I don't think I was fully prepared to navigate the Wedding Industrial Complex and all of the expectations and opinions that get thrown your way - you feel both defiant that it's your wedding and that you two should do whatever the hell you want and also extremely guilty for not pleasing everyone else at exactly the same time. 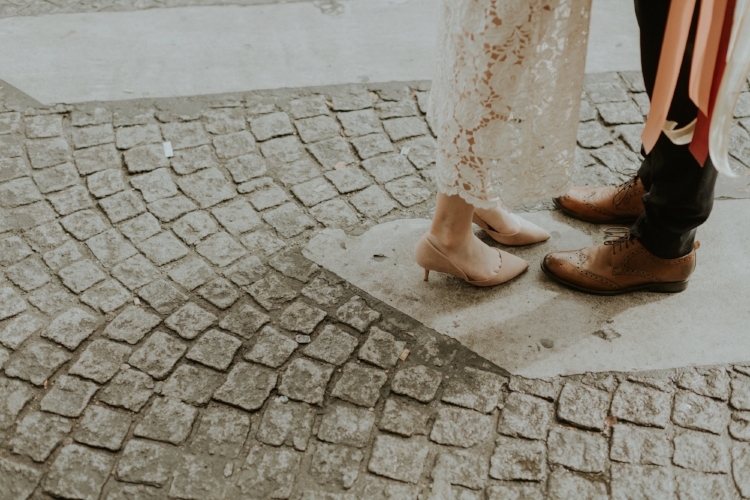 So many things about weddings and marriage are sold to us as essential parts that are not - you don't have to be given away if you don't want to, you don't have to take your husbands surname if something else feels better to you as a couple, you don't have to have a big party and invite everyone in the world that you know. If you do want to do those things that's awesome, but it's also a-okay if you don't. When I look back at our wedding in years to come I know I'll be so proud that we showed up as our whole selves, that we didn't compromise any of our values or who we are as a couple and that we said hell no to anything that didn't feel right to us. I'll also remember how loved we felt by our families and our friends back home too, how beautiful that summers day in Paris was, and how I looked into my favourite humans eyes and we promised each other to be here through all of the wonderful and challenging times ahead to come. And my advice to anyone planning a wedding right now? Never forget that it's just one day and it's the rest of your life together that matters most. Put your budget where your happy is, not where Pinterest might make you feel like you should. Plan a really awesome honeymoon (we went to Venice straight after Paris for a few days for our mini-moon, and then we did a Californian road trip just over a month later for our honeymoon and it was incredible). Don't let anyone make you feel like you have to lose weight if you don't want to (I felt so much pressure about this early on, and then I remembered that I did not care and I would rather say yes to that salted caramel brownie instead). And if family members stress you out or drive you a little crazy during the planing process, set some clear and loving boundaries but also remember that they have permission to feel their feelings but you also have permission to not take responsibility for those feelings. And more than anything, have a whole lot of fun - it's crazy brave to say yes to forever with the person you love the most in the world. To commit to good times and bad, to sickness and health, until death do you part. It's one of the biggest leaps of faith we might ever take - and the love that got us to that moment is worth celebrating. Try not to waste too much energy on the things that don't really matter to you both and just pour that energy into enjoying this time together instead. 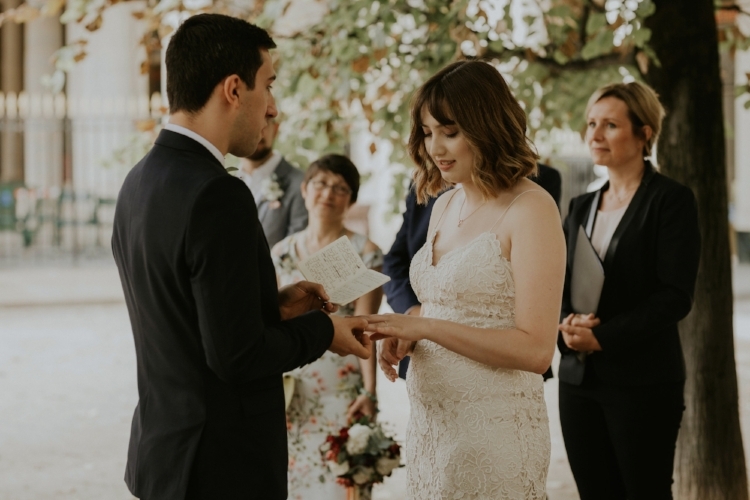 Details: My wedding dress was from Catherine Deane and shoes from Kurt Geiger, Alex's suit was from The Kooples and his shoes were from Next, our photographers were The Curries and our celebrant was Kasia at French Grey Events. The question most people asked us afterwards is if we felt any different. And in many ways, not really. We already lived together, co-parented animals, shared a bank account, and our families already felt like each others family too. But now we can't help but smile at each other whenever we watch a wedding scene on TV or in a film. And I'm somebody's wife and he's somebody's husband and there's comfort and responsibility in that. And I know, every single day, that we're in this for life. I don't know what the future holds, I'm not naive enough to think that marriage will always be easy, but I'm so grateful to do our life together side by side and I know every single day that I'm a better and more braver version of myself thanks to sharing my life with Alex and I hope he can say the same about me too. Thank you for reading and letting me share our day with you!